Weddings are filled with traditions and even suspicions. The whole "something old, something new, something borrowed, some blue" saying is a tale as old as time. So how does this relate to spring engagement ring trends? Well, this season, the jewelry market has seen an influx of blue stone engagement rings. Consider this your "something blue". "Ever since Kate Middleton debuted her 12-carat oval blue sapphire engagement ring, blue gemstones have become an extremely popular option for brides-to-be," Olivia Landau, private jeweler and founder of The Clear Cut, tells us. While it definitely wasn't just yesterday that Kate Middleton got engaged, royal trends never die, and the jewelry world is reacting to the hype. Okay, so blue engagement rings—we're talking sapphires, right? Well, apparently there are multiple kinds of blue gemstones included in this spring 2018 engagement ring trend (who knew?!). Ahead, Olivia dives into the four main blue gemstones—sapphires, aquamarines, tanzanites, and blue diamonds—so you will be able to know and tell the difference between them. Should this blue engagement ring trend be right up your alley, you'll be fully informed and ready to start hinting at your significant other in no time. "Sapphires are the most popular blue gemstone for engagement rings. As an engagement ring, sapphires are strong enough to withstand the daily wear on a hand. They also come in a range of rich blue hues that complement almost any skin tone. They are classic and elegant with a little something extra," Landau says. 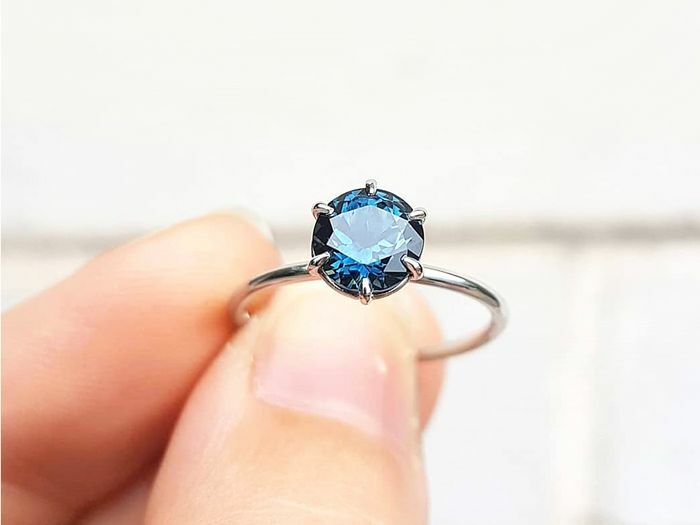 "Similar to tanzanites, aquamarines are very popular gemstones and are beloved for their light blue-green hue, however, they are a softer stone and can be chipped or scratched easily. I would not recommend aquamarines if you plan on wearing them in your engagement ring daily," Landau says. "One thing you can do to protect softer stones like tanzanite and aquamarine would be to set them in a frame of diamonds (similar to Kate Middleton's ring). The diamond frame protects the center stone from a blow and also provides a nice contrast to the blue color." "If you love sapphires, you will most likely be a big fan of tanzanites too," Landau says. "Tanzanites are usually a deep blue color with purple undertones. They are only found in Tanzania and were introduced to the world and named by Tiffany & Co. Tanzanites are on the softer side, so I would not recommend them for daily wear." "The most durable and definitely the most desirable blue stone would have to be the blue diamond. Fancy colored diamonds are truly a great wonder of the world," Landau says. "As you know, diamonds form over billions of years below the earth's surface under extreme pressure and temperature. Sometimes during their formation, things don't always go according to plan. For instance, trace elements or radiation might get in the way and, ta-da, you get a fancy colored diamond. A fancy blue diamond's color is caused by the presence of boron impurities. The more boron that sneaks into the diamond, the deeper the blue color. Blue diamonds are not only extremely rare, but they are also very expensive and valuable." Curious about which other engagement ring trends are bubbling up this spring? Educate yourself here.